I open my eyes and see brown. Brown curtains, brown carpet, brown comforter. The walls are wallpapered - beige background, brown wheat-colored stalks running up and down in neat columns. I roll over, pulling the musty-smelling pillow over my face, hoping it will all go away. Another day, another motel room. We'll leave today and go somewhere else. Mulder keeps driving west but eventually, we're going to run out of land. I asked him once where we'll go when we hit the Pacific. He just smiled at me, that lopsided grin of his, and said, "There are only two choices, aren't there, Scully?" I imagine myself in Mexico. Me, the red-haired gringo with pale, pale skin among the dark-eyed, dark-skinned. Not exactly the place to go to blend in, so Canada it must be. Mulder wanted to go to Canada from day one. In my mind, I plot the route. We'll go up the California coast, up through Oregon, Washington and into British Columbia. I'm even optimistic enough to imagine that once we're amid the tall, green conifers, with the mountains to our east, the ocean to our west, that we will stop. That the endless stream of brown hotel rooms will be over, that we can finally stop and have the life we can't bring ourselves to have. "Scully?" Mulder is tentative as his fingers pull gently at the comforter. I release the pillow and stare up at him. He's holding coffee and doughnuts. "Breakfast is served," he says. "Seven-Eleven's finest." In my new life, the one we'll live out in Vancouver, I'll never eat a doughnut again. "Thanks," I say. I roll out of bed and plod wearily into the bathroom. I lean my weight on my palms, staring at myself in the mirror. Dull hair, long grown out of its haircut, an explosion of freckles across the nose and cheeks, and a little bit of pudginess in general. I'm gaining weight. Doughnuts and inactivity. I'm starting to think that the concept is more glamorous than the reality. The morning ritual is mechanical now. Splash water on face, brush teeth, pull on clean clothes and have breakfast with Mulder. Mulder usually reads the newspaper, I stare at the windows, trying to discern shapes and colors behind the filmy white gauze that separates me from clearly seeing anything anymore. "Hey, Scully," Mulder says, "the baseball strike has been averted." This has been Mulder's great worry of the last few days, that fall will come around and there will be no baseball. I'm worried about aliens, colonization, the baby I gave away, and Mulder worries about baseball. Mulder returns his attention to the newspaper. He spends his afternoons on his stomach, watching ESPN. ESPN is a must in every hotel we stay in. It's the first question he asks after inquiring about vacancies and rates. While he watches ESPN, I try to sleep. I sleep a lot. In the car, in the hotel, everywhere. Sleeping makes the days pass quickly. The landscape rapidly becomes a blur of tan and brown and I think that the desert will never end. I envy Mulder because he doesn't find the tediousness in this new life of ours. He holds my hand, stroking it lightly, kisses me, and tells me that this is what it's always been about: him and me. He says he missed me - and William - so much. I can't tell him how much I missed him; it still angers me when I consider how long he was gone, how long he was incommunicado. How much I wanted him to be there for me, how I struggled with the decision to give my son up, and the desperation that followed, thinking that it would have been different if only Mulder had been with me. Sometimes, I hate myself for needing Mulder so much. I tell myself that as he presses me against the wall, his hands and lips everywhere at once. Sometimes, I find myself watching us and I see what he looks like - eyes half closed, his lips hot and feverish, his touch almost worshipful. And I see me, eyes blank, nails curling into Mulder's skin, and I wonder where I am, how I've disappeared so completely when all I've ever wanted was this man. "The interior light in the car is out," Mulder says now. He doesn't look up from his newspaper. "There should be a Wal-Mart somewhere around here. We can get another one." "Yeah," Mulder says. "I'd like to find a gas station. Check the air pressure, fluids, that kind of thing." I get a sudden vision of Mulder as a mechanic, dressed in a faded blue jumpsuit. I press my lips together as I stare at this man. Gone are the tailored suits, the carefully-picked ties, the neatly polished shoes. He's lost weight, Mulder has, but he's still devilishly handsome. Despite my own ennui at running across America, I know that I would follow him anywhere. Sometimes, I wonder if he takes that - takes me - for granted. "Sounds like a good idea to me," I say. I stretch languidly, ridding myself of the last vestiges of sleep. "I'd hate to break down in a scenic spot like this." I'm referring to the endless stretches of black road scarring the dirt brown sands of the desert. We're in the mountains now and even the cacti refuse to thrive here. If we wanted to be alone, we've done a damn good job of making sure of we'll never seen another human being for days. "Checkout is at noon," Mulder says. He finishes off the last of his coffee. "We can probably make Reno tonight. Or, if you'd like, we can push it to Lake Tahoe, spend a couple days there." He makes it sounds like we're on a honeymoon, not running away from black helicopters and black oil. "Reno is fine," I tell him. The coffee is bitter so I add more sugar. Still bitter and I push it away. Obviously, the bottom of the pot. "Lake Tahoe the next day." "Sounds good." Mulder picks up the remnants of our not-so healthy or delicious breakfast and trashes it. As he passes me, he brushes my shoulder with his hand. For a moment, his touch is warm, comforting and then it's gone. I sit there, hands folded in my lap, staring. I'm only dimly aware of Mulder's fingers on my shoulder again, pushing aside the scoop neck of my blouse - Target purchase, $7.99, I have a whole bunch of these. Silk blouses are not practical in this kind of heat; I've yet to see a drycleaner here in the desert. His fingers play with the strap of my bra as he kisses the side of my neck. "Mulder." I push him away slowly. "What are we going to do?" "What do you mean, Scully?" I look at the room. "This, all of this. Does it ever stop? Do we ever stop?" He looks mournful, his eyes slightly glazing over. "I want to believe that there is something waiting for us at the end," he says. "I can't promise you what that will be, but I know we want the same thing. Whether that's possible, whether it's ever been possible, I don't know." Then he grins. "Don't tell me you're sick of me already." I trace the outline of his jaw, loving the strength beneath my fingertips. "No," I whisper. "Mulder, I know I haven't been-"
He presses a finger to my lips. "Don't worry, Scully." He is still grinning that crooked grin of his and I fall in love all over again. "We're stuck with each other. For better or worse, 'til death do us part." "I know what you meant and it doesn't matter. You think I don't know how this makes you feel? This strange life you've signed up for you? You think I don't regret what I've done to you?" Mulder's voice rises in intensity. "Scully, I think about it every day. All that you've suffered, all that you've given up, all that you've left behind. All for me. How do you think I feel, knowing this?" I swallow hard. "It's not all for you, Mulder." I weave my fingers in with his. "It's for me too." 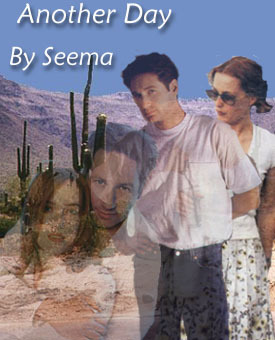 I close my eyes, recalling those few days we spent together a family - Mulder, William, me. For a few perfect days, the X-Files didn't exist. "Maybe it just took me longer to realize it." He turns my chair so that I'm facing him. "We'll stop somewhere nice in Tahoe, I promise." "I'm getting attached to cheap hotels." "You deserve better. You always have." He lays his head in my lap and I stroke his hair lightly. "I'm sorry, Scully." "I know this is hard for you." "We're here together, Mulder," I tell him gently. He lifts his head to look at me. His eyes are watery and I lean forward to kiss his cheek. "That has to be worth more than bad coffee and brown hotel rooms." He smiles and gets to his feet. "Come back to bed, Scully," he says, pulling me up. His arms are around my waist, his lips against my forehead. At this moment, I see only him; my brown hell has disappeared as I let him pull me down to the bed.